Casa Mango your home away from home in paradise. 2 Bedrooms, 1 Bath, sleeps 6-8. The island of Culebra escaped physical damage from Hurricanes Irma & Maria. Casa Mango had absolutely no damage from either storm since it was built to withstand a category 5 hurricane. Casa Mango is a concrete casa built by FEMA post hurricane Hugo in 1990. La Casa Mango is a newly remodeled and refurbished home on the tropical island of Culebra, Puerto Rico. The apartment has a new kitchen and a refurbished bathroom. I am a veterinarian from Iowa and we can rent to you any time of the year. The kitchen, bathroom, bedrooms, floors and walls are all re-tiled and repainted. Juan Rios, the caretaker, lives behind Casa Mango in the casita to the south. Please come down to do as little or as much as your heart desires. In July of this year the down 2 bedroom has been replastered and painted in light tropical colors for a new fresh feeling for our tenants to enjoy. The island of Culebra has been featured in Caribbean Travel and Life (February 2006), Islands magazine (May 2006) with an article on turtle watching and Cont'e Nast (May 2006). Culebra was the lead feature in Cont'e Nast of 10 islands to get away from it all. I can assure you that the quiet serenity and friendliness of the old Caribbean is captured on the island of Culebra. Traveler Magazine rated Flamenco Beach one of the top 3 beaches in the world. Ranked with Acapulco in Mexico and Bondi Beach in Australia. Culebra has 10 other beaches where you may be the only ones to enjoy their beauty. A day trip to Culebrita to visit Tortuga Beach is a must. Tortuga can only be described as the deserted beach you see in the Corona beer TV commercials. The perfection of sea, sand and sky. Activities: Culebra is an island parsdise where you make your own fun. Please do as much or as little as possible during your vacation. Snorkling from shore,scuba diving, kayaking, biking,swimming and hiking are all activities that are free or can be rented in town for a small fee at the Dingy Dock through Ken. Exterminator: I pay a licensed exterminator to come in monthly and set insect and rodent traps. A property that does not use an exterminator at least monthly WILL have vermin invading the property. Casa Mango is as free of vermin as possible in the tropics. I do not believe a renter on vacation should put up with unwanted guests that are not paying rent any more than they would at home. I am a veterinarian from Iowa and I have been going to Culebra since 1998. I enjoy sand, sun and sea be it a tropical island like Culebra or Egypt. Casa Mango is composed of 2 units. The up 3 bedroom will sleep 12-14 with 5 queens and 2 queen sofa couches. The house is fully furnished to cook and we have retiled the property and the house looks fabulous. The balcony that runs around Casa Mango is also newly tiled. The down 2 bedroom can sleep 6-8 in 3 queens and a queen sofa couch. The 2 units can also be rented together to sleep 18-22 people. A unique benefit is that my caretaker Jorge lives behind Casa Mango in the casita. He will be present to give you the key. A contract explaining the house rules and the best advise of where to go, eat and celebrate. Jorge's phone # is 787 238 1038 and speaks fluent Spanish. Call Jorge to discuss the benefits of staying @ Casa Mango. The bathroom is totally renovated, repainted and re-tiled. The shower has been enlarged and has hot water. Towels are furnished and replenished as needed. The property has a new washer and dryer that can be used by all renters outside that stay more than 2 days. Melones 1 mile. Flamenco Beach 3 miles north. Downtown Dewey in walking distance. Queen sofa couch with coffee table. We have 7 high dining chairs that are at a dining counter. Large out door patio with table and patio chairs. Casa Mango is totally renovated, repainted (inside and out), re-tiled and refurbished. Friends and/or family can drive or taxi to numerous beaches for swimming, snorkeling, sunning or doing nothing at all. Culebra is unique in that a large cruise ship cannot dock there and jet planes cannot land at the small airport. The coral and fish are fabulous and just off shore. Fishing from the dock, shore or deep water sail fishing is also available. The apartment has high speed internet access from an antenna and a cable to your laptop. The town of Dewey is a short walk away. The restaurants in Dewey and around the island serve a variety of seafood, Puerto Rican specialties and other Caribbean treats. A great beach house with the best caretaker on the island, Jorge. When we arrive the house wasn't clean at all and the beds weren't even made. The problem got solved at 9:00 PM that same day because we called the owner who lives in the US. I don't think he is aware of the conditions of the house since it is advertise as newly remodeled and the house is clearly not. The same day we arrived there was a mouse in the kitchen and traps were put by Angel (maintenance guy, who was very nice but didn't do his job on time) and caught 4 mice within hours in the kitchen and there were still more. There were mouse droppings on the dishtray and the stove and the refrigerator was dirty. Overall if the house would have been clean and there were no mice in the house it would have been a somewhat better experience but next time I'll rather spent more money on a better place. The review by Anonymous is a fake review that I cannot get Homeaway.com to delete. The fake review is over 10 years old. The new caretaker, Jorge , lives in the casita behind Casa Mango and specializes in being available and is a cleaning machine. 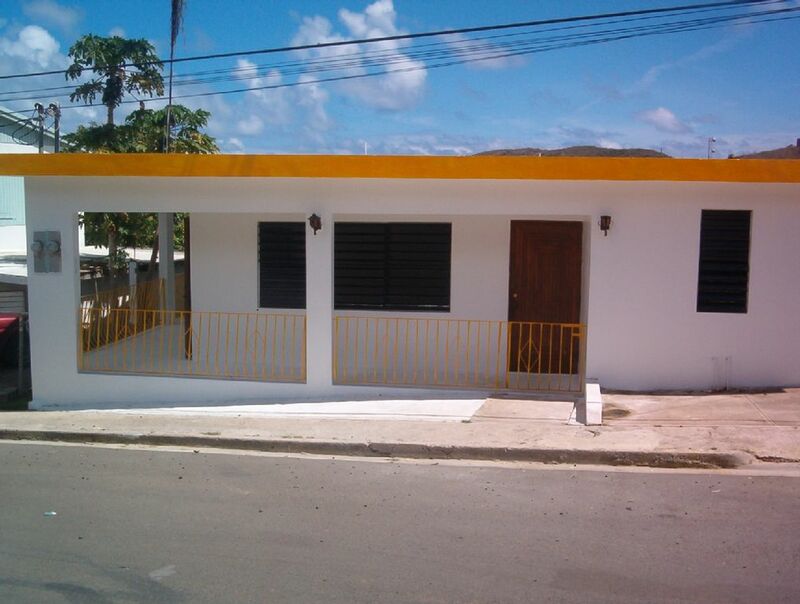 Jorge (787 238 1038) takes a personal interest in the property and the clients of Casa Mango. Jorge is available to help make your visit to Casa Mango, Culebra & Flamenco Beach the trip of a lifetime. Culebra is a gem. The island is unique in that cruise ships cannot dock there and jets cannot land at the airport. Development on the island is limited by strict zoning laws passed in1974 after the U. S. Navy stopped bombing the island. A large portion of Culebra is a nature preserve and bird sanctuary. Culebrita and Lus Pena Island are also marine preserves. Casa Mango is located in Rural Clark Barriada Flamenco. Culebra, Lus Pena and Culebrita have dozens of white sand beaches awaiting your arrival. I have a mischevous spirit on Culebra that is not a sycophant but enjoys playfully annoying me. Perhaps you too will encounter a spirit of your own while visiting Culebra. Check out time is 11:00 AM and check in time is 4:00 PM. We will try to accommodate early arrivals if possible. However, Casa Mango has to be cleaned after rental before the next party can receive the key and move in. The down property may be combined w/ the up 3 bedroom to rent the entire house. The 5 bedroom house rents for $500/ night.